“What exactly is a scar”? When you injure your skin, your body naturally repairs the damage. How your body repairs this damage depends on how deeply the injury penetrates your skin. 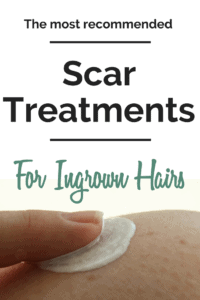 In this article, you will learn how to get rid of Scars from ingrown hair. If the injury damages the top layer of your skin, you’ll likely see new skin when the wound heals. To repair the damage that goes deeper than the first layer, your body makes a tissue that’s thicker than your skin. This thicker tissue often becomes a scar. New scars have a pink to reddish color. As a scar matures, it often turns lighter or darker than your skin. Many of us who are plagued by ingrown hairs often see the end results for years. Scars. For most people, they are almost inevitable. They can be unsightly and embarrassing. So how do you get rid of them? Start with prevention. Chances are you got the scar from picking an ingrown hair bump or scab too much. Stop doing this!!! I know its easier said than done. So start preventing ingrown before they even get to the stage where you want to pick at them! The best way to prevent ingrown hairs is to determine whether shaving or waxing irritates the skin and hair worse. Choose the method which irritates the area the least. You may have to experiment with a few hair removal methods over time but you should eventually find one that works. Exfoliate, cleanse and moisturize every single day with a scrub glove or exfoliation brush. Be gentle and use a good quality soap. Lather the soap in the glove and gently scrub the area. Do this every day until the bumps subside. Apply a light moisturizer or ingrown hair serum after. You are probably reading this article because already have done the damage and want to know how to get rid of Scars from ingrown hair. It won’t be easy and you may only get a slight reduction in scaring but the end results might be worth it. Start with exfoliating the area every day. I know you’ve heard this a thousand times but you have to keep exfoliating off the dead skin cells so the new ones can come in healthy. Massage olive oil over the scar. Olive oil is rich in vitamins E and K, which will help in getting your scars to fade quickly. Virgin olive oil is particularly high in anti-oxidants and has a higher acidity level, which helps to lighten the scars. Rub a little bit on to the scar and massage into it for 10 minutes. Raw honey is a natural moisturizer. It can be effective in the treatment of wounds and stimulates tissue regeneration. It can also be used to fade scars. Massage for 3 minutes and wipe clean. Apply lemon juice to the scar. Lemons contain alpha hydroxy acids(AHA) which help to remove dead skin cells, help new cells grow. It can help lighten scars. Silicone is the #1 Treatment for Scars, and FadeAway is the gold standard. FadeAway’s 100% Medical Grade Liquid Silicone comes in a massaging roller ball applicator that helps to break down scar tissue. The Liquid Silicone comes out clear, non-greasy and dries quickly. Great for discrete treatment and ideal for areas of high visibility. The Liquid Silicone Massaging Roller can be used in conjunction with FadeAway Scar Sheeting to provide a powerful system to reduce the appearance of scars. Choose FadeAway to not only get a discrete, perfectly fitting scar treatment but be confident knowing it’s the same product you’d be sent home with after a surgery. Mederma Advanced Scar Gel can help you ease the doubts because it’s clinically shown to improve the overall appearance, color, and texture of scars. More doctors and pharmacists recommended Mederma than any other brand for older and newer scars. It works for many types of scars, including acne scars, surgery scars, and scars from burns, cuts, and other injuries. And since you only have to apply Mederma Advanced Scar Gel once a day, it’s easy to use. An efficacious reparative oil for face and body. Contains pure natural rosehip oil. rich in essential fatty acid (omega 3 and 6). Provides all-over hydration. strengthening and healing action. Remarkably corrects the appearance of scars. stretch marks. fine lines and wrinkles. Effectively treats dehydrated and aging skin. Unveils a softer. smoother. more refined and healthier looking complexion. A patented formulation that combines multiple technologies into a product that is easy-to-use. That is why so many doctors use this product for old, raised scars, keloids, and to help prevent scar tissue from forming after surgery or injury. Use the advanced Aliver acne scar removal cream, easy to penetrate the cortex, soften the scar tissue, promote the skin’s natural renewal and healing, quickly fade the scars. Our scar cream also has the anti-inflammatory, bacteria elimination, beauty and skin nourishing, scar and acne mark removal, and makes the skin smooth, soft, beautiful and texture. No matter which method you choose make sure to check with your skin care specialist or physician to choose a treatment right for you. Remember the best method for preventing scaring is to treat ingrown hairs as they appear and to be proactive about it.